The trail crew and local stewards (15, 3 for each network) removed leaves, debris and down trees in HTF, Carse, Saxon, Sunny, Mud Pond and Sleepy Hollow in late April till mid May. It is quite the process to make sure that all the water-shedding installations are clear and a clean line of sight is opened on 100 plus mile of trails. By mid May we had our other 6 networks cleaned up and we began to finish the last third of a mile on Maiden. Bridges over flowing water, armoring in seeps and benching was performed to drain water into intermittent streams and on to the forest floor. The beginning of the Maiden from Hayden East was rerouted to higher ground and 40’ of puncheons laid down to keep trail out of a water holding area. This project included the restoration of Maiden, International and Dragon’s Tail with a RTP grant we received from the State in 2011. International was started in early June and the 1.75-mile trail was finished by the end of June. Once again we placed a 100’ bridge in the beginning in a seep holding area that is wet almost through the year with another 6 areas of bridging totaling up 120’. Rock armoring was installed in 18 areas covering over 220’ so water can absorb down the armoring to reach the forest floor to be absorbed along with benching and out slopping for surface water to move off the trail. During this time we had 4 corporate groups assist us, totaling up to 130 volunteers throughout a 6-day period. By July 4th we were ready to tackle Dragon’s Tail performing the same type of work we have mentioned above. This trail since it leaves the parking area and travels farther away was renovated to not have sediment run off the trail but to leave the roots, rocks and natural features there. We finished this trail by mid July. The next project was to complete a major renovation of the Backdoor starting at the top of the HTF at Dragon’s Tail and went down to Lincoln Hill road covering about 2.2 miles, with several reroutes added. This project took about 20 days. Better signage was added, lots of derooting for this climbing trail, water-shedding outlets every 20-60 ft, 220 ft of armoring in seep areas and the addition of climbable berm turns under 8% grade. Saxon Hill was our next area of concern. This silt moraine area has been eroded to the point it is a mud hole for over 400 ft. We installed a rollercoaster bridge 24” wide, 425’ long with dips, tilts and slope into a berm turn. We then proceeded to redo and correctly build 28 berms with skeletal material of rock or logs as the base with a smooth arc on top. Three reroutes were put in of over .25 miles, 80’ of armoring and water-shedding outlets every 20-60’ were added. HTF in September became the last big project. We have been diligent to get HTF back to great shape for walkers and bikers since we have not been in there for 4 years. Complete signage was redone, clearing of every trail from blow downs, Backdoor from Hayden West was redone, Lost was opened and Missing Link was upgraded. FOTW trail crew assisted with Michelle Fisher for 4 nights during the off-season to renovate, inform and make more accurate the Map of the trails in the HTF. We then assisted with Stewart J. and hung all the signs made by the Trails Committee. 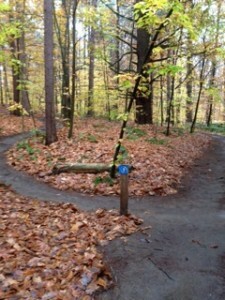 We then, with the assistance of Lenore Budd added signage between the start and finish of all the trails in the proper color to ensure travelers could find their way through all seasons. A big thanks to the Trails committee for their vision to have better signage throughout the forest. The trail crew just finished the last of the signage this past week. The RTP Grant from the State was a huge project to complete. We would like to thank the HTF Committee for their support of the grant at its conception. We received $26,000 for the grant and we matched it with about $15,000 for labor and materials of our own. A total of 20 Volunteer work events were used this season, with over 1400 hrs placed into the trails. FOTW sponsored snacks and drinks at each event with some sort of swag to give out. We raffled off two bikes this year a high end Mtn Bike and a Fat Bike in the late fall. Flyin Ryan foundation and FOTW put on a joint fun Mtn Bike event at Catamount trails that was very successful along with four area restaurants that donated 10% of the purchases of dinners for one night to FOTW. FOTW board of directors took an acting role of a working Board to pick up the administration responsibilities that were previously being done by Andy Weiss. The Board meets every two weeks from April- December then once a month. The board and the trail Director successfully met their budgets and we performed more work this year than any other year on the trials. Somewhere around 8 plus miles were totally redone. FOTW partnered and financially supported VMBA membership template for the 2014 season. We look forward to renewing this next season. We appreciate the relationship and it was a good first year under the umbrella of VMBA.